One of the most frightening things about living in a big city is the possibility of a break-in. Even if you aren't home when the invasion occurs, the thought of someone going through your things is incredibly unnerving. In order to give themselves peace of mind, many homeowners outfit their domiciles with security cameras. In some instances, those cameras only serve to create terrifying surveillance footage of home break-ins. There are many cases of CCTV footage leading to arrests, and some of the home intruders caught on camera were apprehended after their videos made it to air. However, there are other intruders who starred in a straight-to-evening-news security video and remained free, even after their faces were burned across regional reports. Are you worried that people may be breaking into your home at night and eating your food or trying on your clothes? If so, set up a home camera to capture those home invaders and see if your suspicions are correct. As you may soon find out, it's not all that crazy to believe someone might be watching you sleep. And even if this list doesn't inspire you to set up a web of security cameras to monitor unintended guests, you should at least be motivated to start locking your doors and checking under your bed at night for rogue clowns and general creeps. 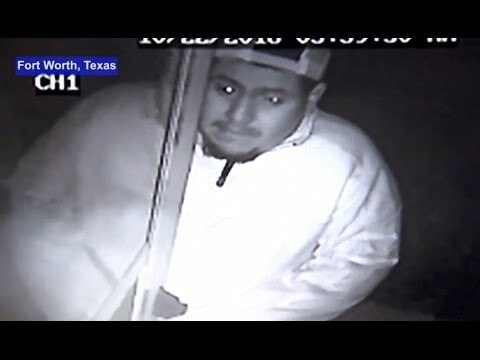 In October 2016, a Texas man's personal CCTV captured a person dressed as a clown carrying a knife, apparently in hopes of entering his house and beginning a carnival-themed spree of mayhem. In the video, the clown tries out the locks, looks through some windows, and then tries to open a gate. This morning I noticed my gate was open. 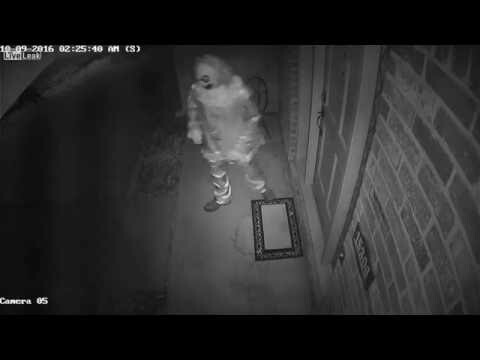 I checked my surveillance cameras and found someone in a clown costume was trying to get into my house. I'm sure we would all be dead today if he was able to get in. Should Roseanne's Show Have Been Canceled Because Of Her Racist Tweet? A man in Layton, UT, broke into a family's home in May 2018. He was caught on a nanny cam. The unidentified man entered the home around 3:40 am, walked past the sleeping baby in the crib, and made his way to the side of the mother's bed. The family had no idea. "Our sliding door to our bedroom was halfway open," the father told local news station KTSU. He noticed things were out of place the morning after, so he decided to consult the nanny cam. While the police only released a portion of the video, local news station Fox 13 claims the unidentified man exposed himself while standing next to the bed. No one was touched during the act. The mother said she was "terrifie[d]" upon learning about the intruder. What was even more worrisome to the couple was the fact that there was no sign of forced entry, which led them to believe the man had been watching them for some time and learned their garage code. Authorities speculate the man could possibly be a friend or acquaintance. I woke up to him putting his hand over my mouth and nose and strangling me with the other hand. At first I was immobile because I thought I was in a dream. She related that the intruder instructed her to take her pants off before she tried to escape through an open window. As she tried to escape, the man dragged her back in. According to the footage, the intruder then gave up on the assault and fled the home before anyone in her neighborhood could call the police. My heart immediately started pounding and I didn't know what to do except just run out. The way he looked and the way he shuffled scared me. Allan took off running and luckily found a neighbor who was more equipped to handle the situation. She continued the story: "He was running and I said, 'Allan, are you OK? Is everything OK?' And he said, 'No, there's a stranger in my house and I saw him and he saw me.'" The intruder escaped with nothing more than a cell phone, which he dropped in the woods. He was caught less than 24 hours later and identified as 23-year-old Thomas Coughlin.